Today’s winter solstice in the northern hemisphere has been marked by the now traditional sunrise ceremony at the 5000 year old burial mound of Sí an Bhrú, or Newgrange in County Meath, an event observed by visitors and audiences around the world, the latter watching via live television and online broadcasts. The Sí’s alignment, which funnels the rays of the dawn sun down through a so-called “roof box” at the passage-tomb’s entrance to an interior, dry-stone chamber around December the 21st of each year has made the site one of Europe’s best known Megalithic monuments. In fact, the contemporary and pristine-looking version of the formerly dilapidated and vandalised mound is the result of substantial restoration work carried out by archaeologists and historians in the 1960s and ’70s. This labour remains a matter of some controversy. Simply put, aside from questions of authenticity or interpretation, the reconstruction effort has given rise to the popular – if mistaken – belief that the famous entrance to Sí an Bhrú is an accurate representation of how the passage-tomb would have appeared around 3200 BCE, the period of its construction. This is almost certainly untrue, the startling white quartzite stones and cobbles of the wall surrounding the entry to the mound, with its backing of steel-reinforced concrete, reflecting a modern need to facilitate visiting tourists not proven archaeology. Unfortunately this image of the Sí, admittedly powerful and appropiate looking, has become so impressed on people’s minds that even historical artists and authors include it in their textbook illustrations. A report by the Irish Times examines the subject of the midwinter solstice at the Sí, a thorny one in the world of Irish archaeology and heritage tourism. “Trapping the winter solstice sun at Newgrange in Co Meath is not a 5,000-year-old phenomenon, but a 50-year-old “construct”, according to a former State archaeologist. 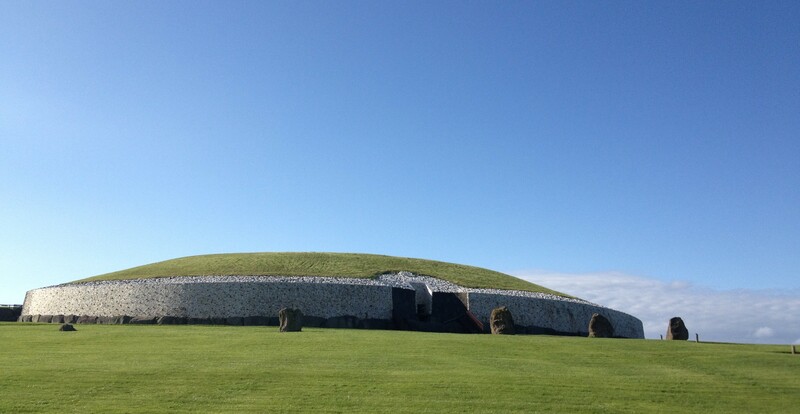 Our Stone Age ancestors were not as clever as we thought, and the significance of Newgrange as a “Hiberno-Roman” cult site in the late Iron Age has been deliberately underplayed, Michael Gibbons, co-author of a paper on the subject, argues. If skies are clear during sunrises from December 19th to 23rd, a narrow beam of light penetrates its “roof-box”, reaches the chamber floor and extends gradually to illuminate the entire chamber over 17-minute period – marking new life at the turn of the year. However, in an article published in archaeological journal Emania, Mr Gibbons and his brother Myles take issue with the excavation and reconstruction work carried out on the passage tomb half a century ago by the late Prof Michael O’Kelly, including the famous “roof box” for trapping the sunlight – said to be 5,000 years old. Discovery of “high value” Roman artefacts inside and outside the tomb, along with remains of dogs and horses, point to an Iron Age burial site dedicated to an “Irish elite” with links to Roman Britain, the Gibbons paper argues. It takes issue with Prof O’Kelly’s contention that the tomb was largely unaltered from the Neolithic period, and says that Iron Age activities may have included construction of an enclosure or “barrow” on the summit and alterations to the mound’s profile. The description of the roof box as a “fabrication” seems to be an overly harsh judgement. Similar celestial alignments are known from other archaeological locations, notably at An Cheathrú Chaol or the Carrowkeel Megalithic Cemetery in County Sligo, one of the more important “sacred” sites in Ireland. Admittedly none are as clearly or unambiguously designed as the reconstructed opening at Sí an Bhrú but its authenticity has not been disproved. In contrast, the association of the surrounding Brú na Bóinne landscape, a monument-rich region known as the Newgrange or Boyne Valley complex by archaeologists, with a theoretical Hiberno-Roman cult seems to be a far more egregious claim. Certainly the area was important throughout the pre-Christian and early Christian eras. In the transition period between the prehistoric and Medieval centuries, the Uí Néill dynasties of north Leinster and the Midlands occupied the fertile territory of counties Meath and Westmeath. Their contacts with the Roman Empire and its successor kingdoms in Britain, both predatory and mercantile, fueled their noisy rise to political prominence and eventual dominance across much of the northern half of the island. However the Uí Néill peoples, in whole or in part, were certainly not “Hiberno-Roman” nor do Roman artefacts suggest the presence of the “Romans” themselves. All of the non-Irish items at the Sí could have been sourced through trade and pillage in Britain and Europe, and taken there as votive offerings by local lords and kings. Once again one must state as matter of simple archaeological fact, that there is no evidence of any formal Roman presence on the island of Ireland. Mercantile goods do not make for political representatives, immediate or tributary. Update 22.12.2016: The Office of Public Works (OPW) has issued a scathing response to the claims by Michael and Myles Gibbons. Michael Gibbons is an a**hole. is gibbons not missing the point. the passage itself is aligned to the solstice sunrise. the sun will fall on the entrance regardless of how its is configured, but the passage has to be exactly aligned to allow the light to reach the tomb. unless he s suggesting, without presenting evidence, that the entrance was designed to deliberately block the sun, but then why bother aligning the passage so carefully. Also, the roman invasion of britain is well documented in contemporary records. how could there be no record of a presence/link in ireland. the objections he raises have the distinct whiff of tin-foil hat stuff.